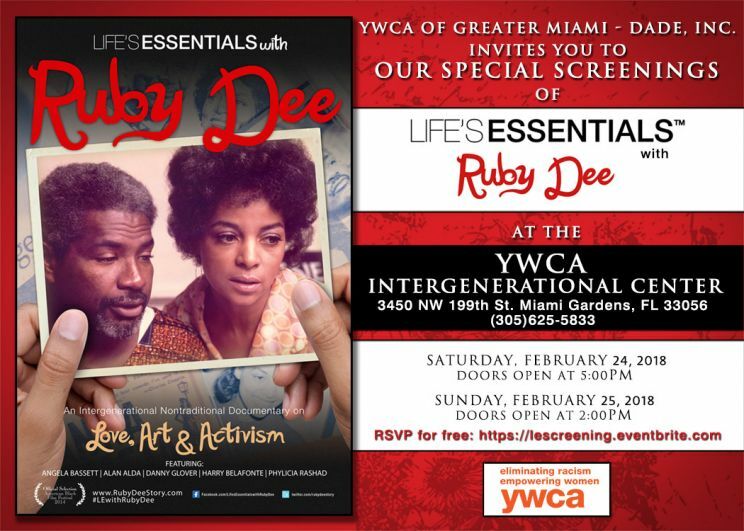 MIAMI GARDENS, Fla. - Feb. 21, 2018 - PRLog -- On Saturday, February 24 - Sunday, February 25, 2018, the YWCA of Greater Miami-Dade will host a special Black History Month presentation and discussion of "Life's Essentials with Ruby Dee," a documentary written and directed by Muta'Ali, the grandson of the actress and her husband, the late actor Ossie Davie. In this open-letter style documentary, the rich lives of Dee and Davis guide their grandson on a personal quest to master lasting love, conscious art, and undying activism. Ruby Dee and Ossie Davis were two icons who stood on the principles of a strong family unit, positive artistic representations of "their people," and social activism. The story centers on Muta'Ali, a filmmaker coming of age who fears he may dishonor the lives of his iconic grandparents with his contrasting take on their values. The 90-minute documentary features Angela Bassett, Alan Alda, Danny Glover, Harry Belafonte, and Phylicia Rashad. The film will be shown on Saturday, February 24 at 5:00 p.m. and Sunday, February 25 at 2:00 p.m. at the YWCA Intergenerational Center in Miami, located at 3450 N.W. 199th Street. A conversation with Mr. Muta"Ali will follow each screening.